Goodbye, House. Hello, Home! 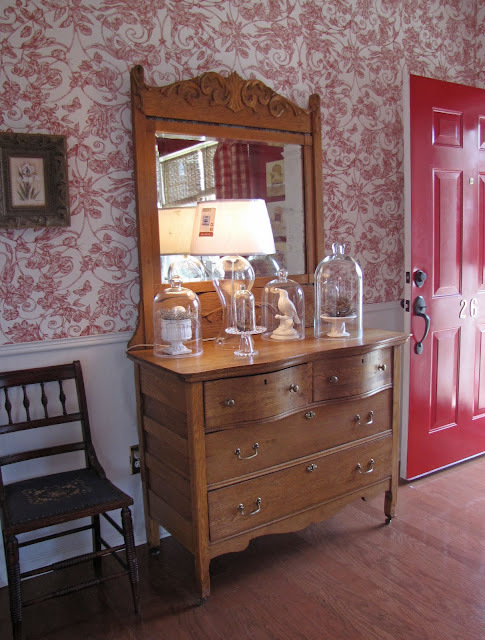 Blog : Cloche Addiction a New Lamp/Shade and a ? I think it fits in great! I can't believe it was only $3 and the shade too, 3.99, quite the deal. 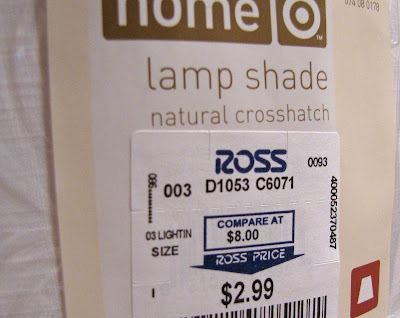 I had no idea Ross sold Target stuff. I am in search of a shade and will check our Ross. You could even use the lamp as a cloche of sorts. I have a small glass one that is hollow and I will stick stuff under there for Fall and Christmas. 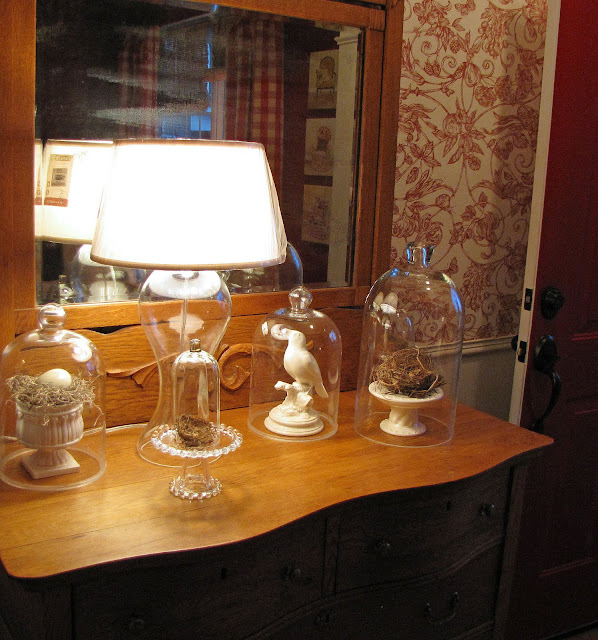 I think the lamp works fine with the cloches. I think I would try it on one side of the chest and group the cloches on the other as a collection separate from the lamp. You sure got a good deal. I am loving your lamp and the shade is perfect! What a great find! I just started collecting cloches so I could participate in Marty's cloche party. I never really paid that much attention to them before and now I love them! I found another one the other day with some vintage writing on it...I had to have it! I agree with Kim!!! You lamp and clohes are all beautiful! I bet you can already guess what I am going to say! 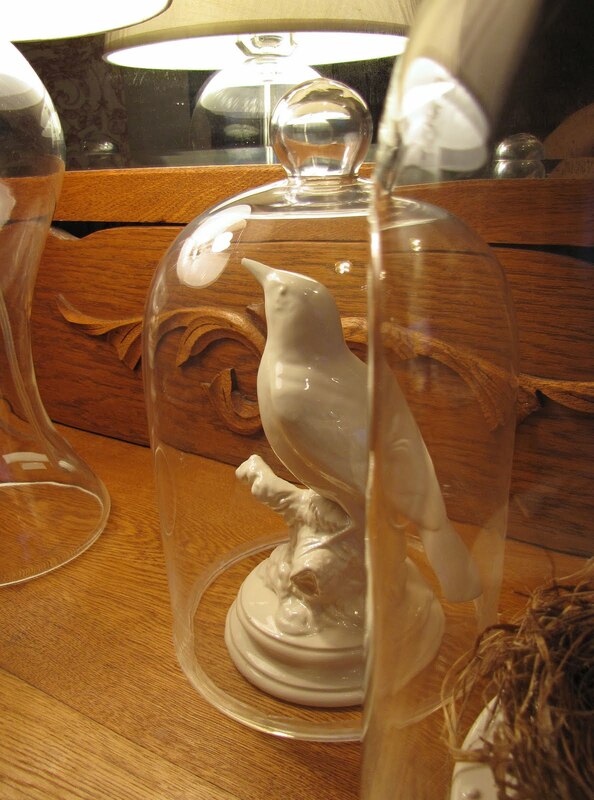 I love them, they do play nicely with each other and the best thing about cloches is that they are never too busy. I may be the only one, but to me, even though these "match", I do think it is too many items of like size and color in once place. It looks closer to "cluttered" instead of "collection". BUT, if dispersed a bit more throughout one room, I could totally get on board with it. Wow, great bargains there, Leslie! 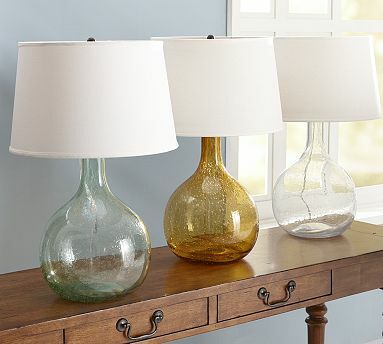 I love seeing these glass lamps that are so much like the Pottery Barn ones, but much less in price. 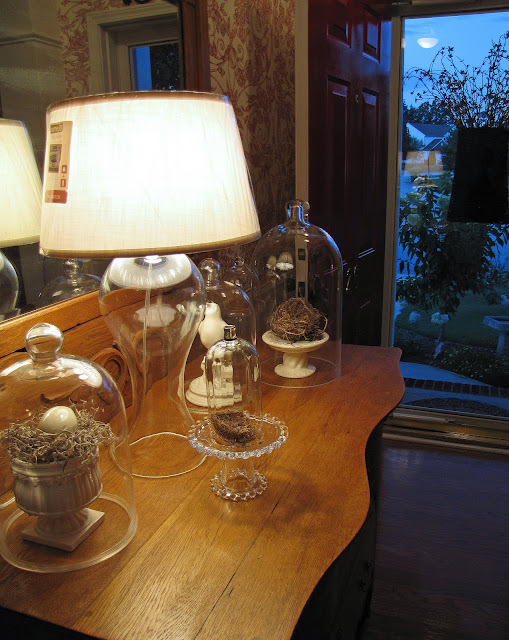 I like the lamp with the cloches ~ do you have a little something to put underneath that goes with your theme? On a report card, the lamp would get a check mark by "plays well with others". 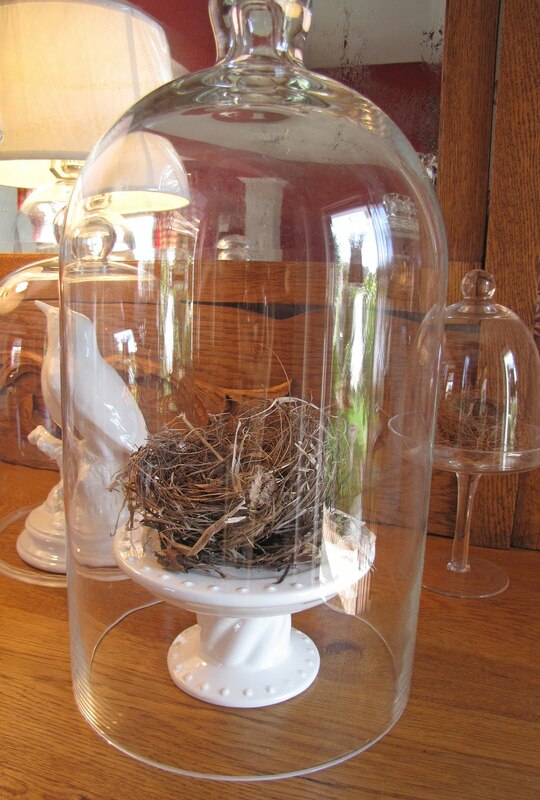 BTW, LOVE the cloches. We were just having a little cloche discussion around the Sunday table yesterday. I love them, and since I'm such a big bird person, your are particularly pretty. I vote an enthusiastic "YES" to the lamp. I actually like it better than the other high end store lamps. I would agree with Kim, shifting the lamp to one side and the cloche collection to the other side. Since collections are best in odd numbers, perhaps remove one and leave three. I absolutely love the look so it's hard to critique. Just throwing out the things learned in training. Be sure to post your final arrangement. It's a simple dramatic statement! Love it! I love the lamp. 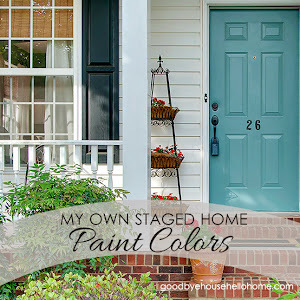 I am decorating challenged, so will not be offering an opinion. 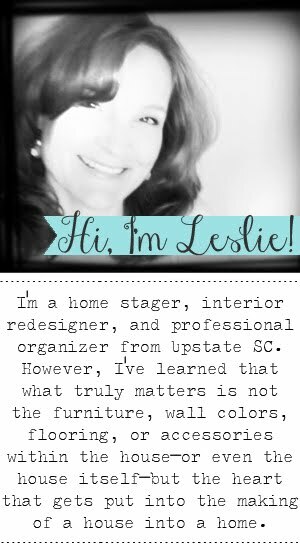 :) Your home and furnishings are sooo beautiful, I'm sure whatever you end up with will be great. It all looks wonderful. I love cloches...in other people's homes! They wouldn't last a day at my house! I'm loving cloches right now too! Trying not to be jealous of that lamp and 2.99 (!) shade. I really love it. I think it would play nicely with anyone - it's just got one of those personalities...everyone's gonna want to be it's BFF. I sent your link to a friend who wanted to know where my blog had gone. I told her this was one of my favorites. (She probably won't comment or anything - just read quietly). I got your comment Leslie! I'm sorry you were having trouble leaving one. I'm not sure why. Hopefully it is fixed now :) I can not email you back though as you are still listed as a "noreply" so your email is not there to reply to. 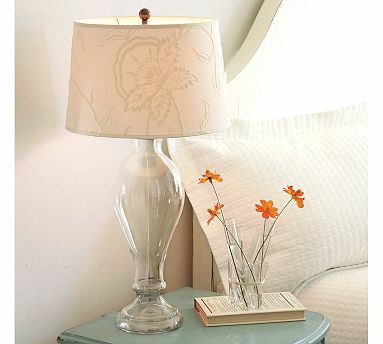 Love the lamp! What a deal! 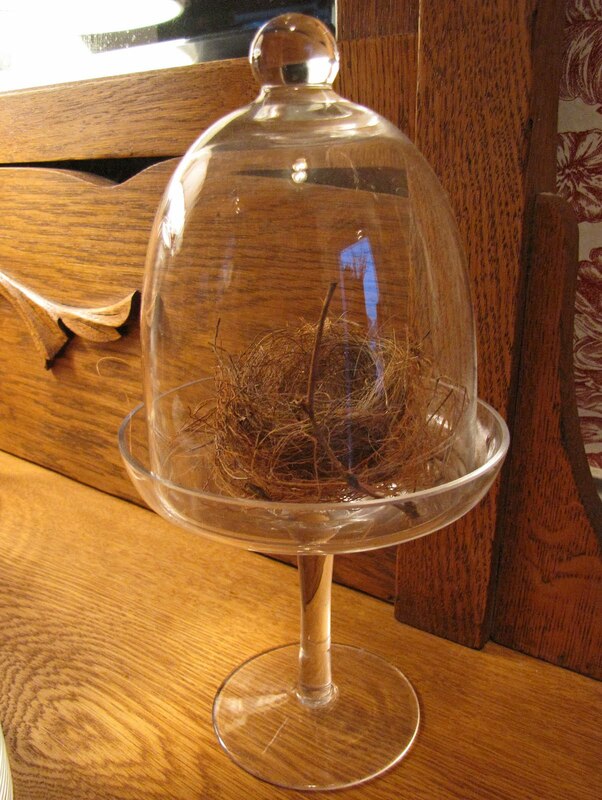 Your little birdy nests are just wonderful. 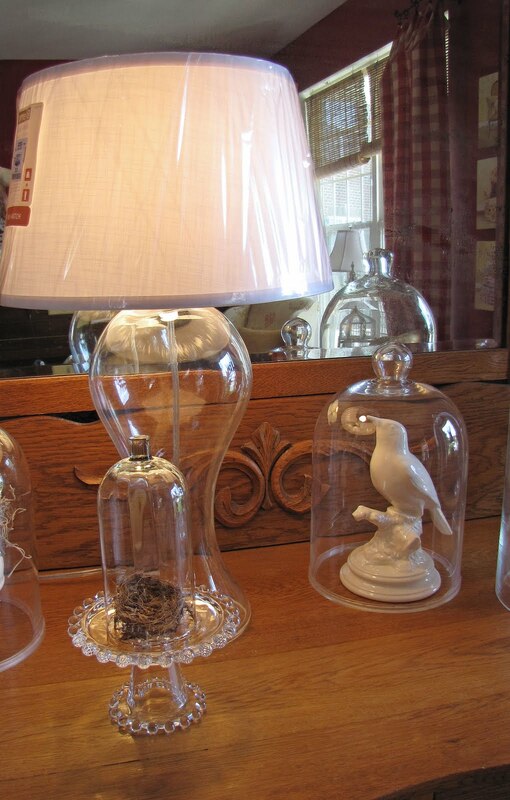 Love your lamp, it looks great with the rest of your cloches. That is a very nice vignette. whatever you want whenever. That is cool, and versatile. I like versatile for sure. 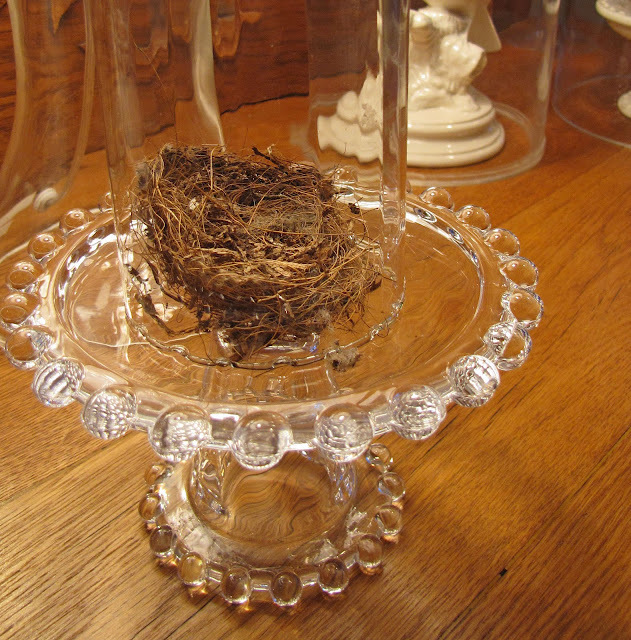 Your nests and birds are very pretty too. Great find and yes, it does look great with the others! I like how it added height to the grouping. I think it looks beautiful! Super pretty, and very unique, I have never seen one like that. I do believe it works...I personally would have it to one side, and perhaps eliminate one cloche...see how that works...great deal! Hi, love the urn with the littel nest and egg and again love your red toile paper!!! Best to you, kate, will be coming up your way, aug 21,22 to the show house in flatrock, nc. will be in hendersonville 3 days!!! 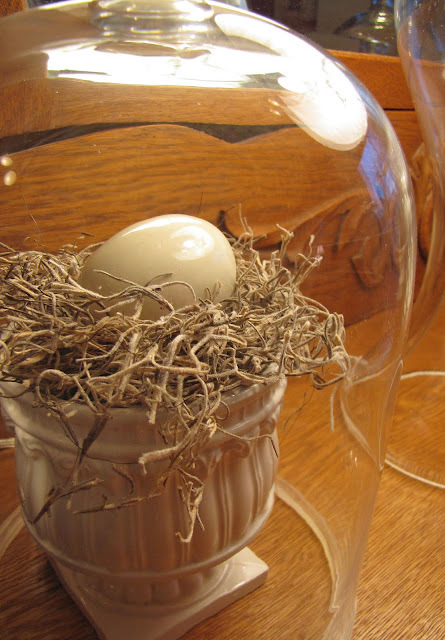 You are the Queen of Treasure Hunts always finding the 'golden egg'! The lamp and shade are spectacular. Your cloche collection is stunning. I would cluster them opposite the lamp and perhaps display some on a stack of old dark vintage books to add more contrast and vary their height. It looks perfect. You were very lucky to have found a glass lamp like that. I do not beleive I has seen any in this area. 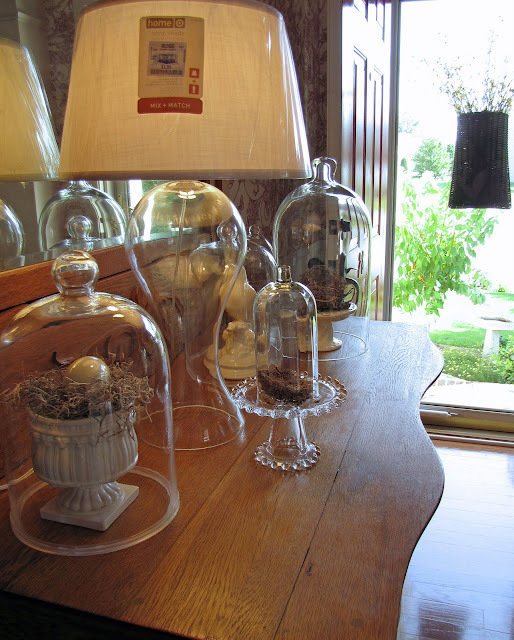 Love your cloches too!!! Thanks for sharing. 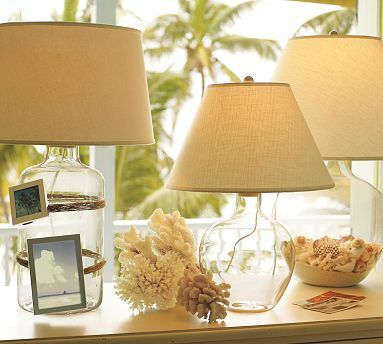 I really like that lamp I have never seen one like it, I am going to keep my eyes open for cloches, I love them and don't have a one! 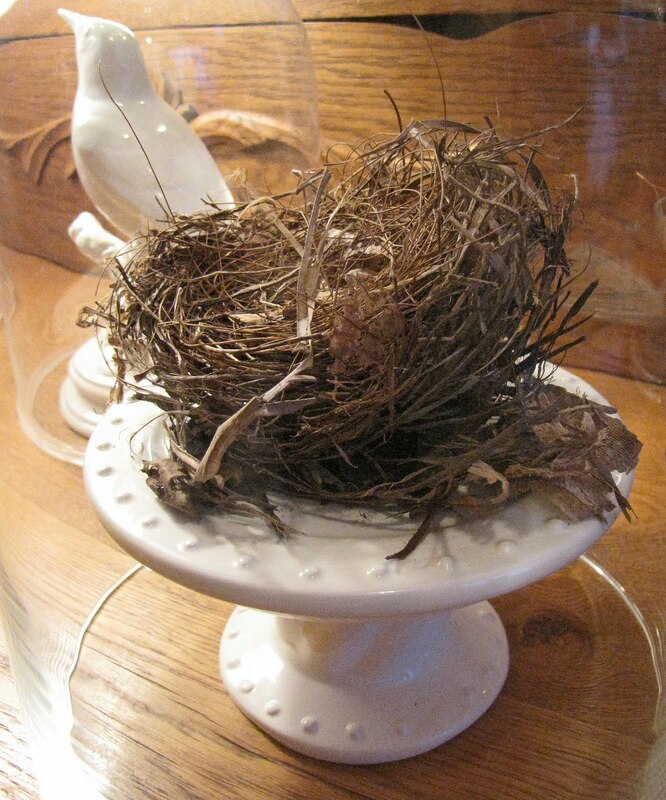 I wish I had a yard full of darling birds nests! 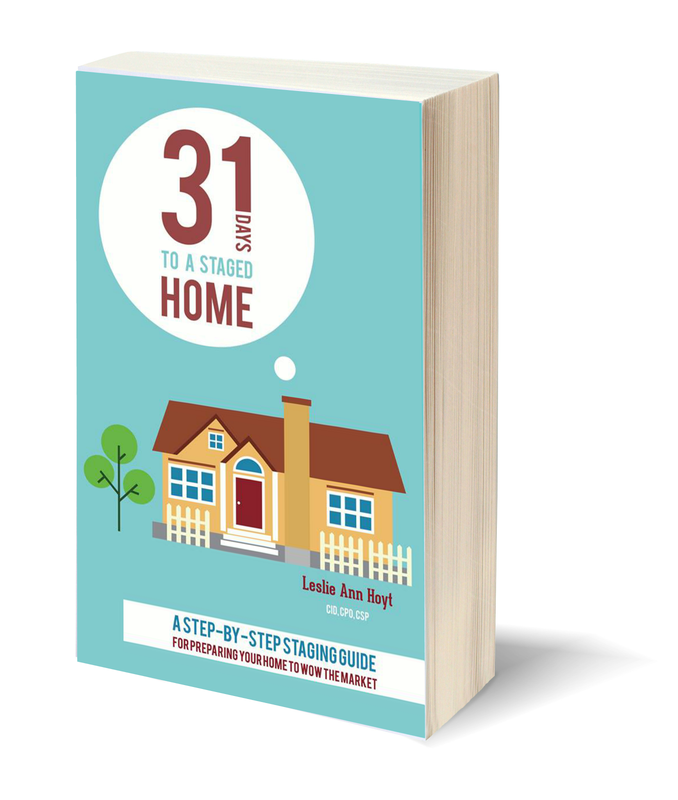 That's the bottom line for most of us, so spend your time and money doing those things that will make the house sell more quickly and for money.